Home > About Our Products > What are Sill Shields? Sill Shields are available in white and clear! 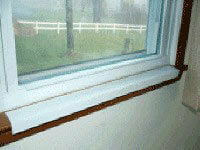 -Are made from .060 gauge heavy duty outdoor grade PVC similar to vinyl siding. -Are an easy, inexpensive way to avoid a common problem. -Not only protects the wood surface beneath sills, they hide the scratches. -Unlike painted surfaces, Sill Shields are white all the way through so scratch marks won't show nearly as bad as they do on painted wood. 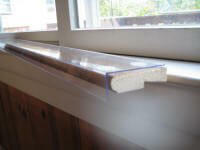 By popular demand, we now also offer clear Sill Shields for those of you with stain sills. They are made of a special high tech plastic resin that is very clear and strong but not brittle. Keep in mind however, that they will scuff and do show more wear and tear than the original white shields. White sill shields are our preferred choice. All sizes of Sill Shields are easily installed with the use of peel and stick Low Profile Dual Lock Coins made by 3M (included with your order), so there are no tools needed. Sill Shields come in a variety of sizes to fit most any window! ONLY $12.99 FOR STANDARD SIZES!